A team based at the University of Miami and Hangzhou University in China have demonstrated the use of an iPhone-connected slit lamp that allows an ophthalmologist to direct and interpret an eye exam on a patient thousands of miles away in real-time. Ophthalmologic disease is a cause of significant disability worldwide. Access to the early screening that can help prevent these conditions are often lacking in resource poor areas. That access is limited by the inability to get the right equipment out to where it is needed as well as the availability of qualified professionals. A group of ophthalmologists aimed to address those two issues by leveraging consumer mobile technology. First, they paired an iPhone 4S to the viewing portion of a slit lamp. The images seen by the operator were simultaneously displayed on the iPhone screen. Using this platform, a slit lamp exam was performed on a healthy volunteer in China. The images were transmitted in real-time to an ophthalmologist in Miami using Skype; both the ophthalmologist in Miami and operator in China were able to communicate with each other as well. This prototype demonstrated the feasibility of having an ophthalmologist view a slit lamp exam performed by a remote operator anywhere in the world, both viewing the images being captured and providing feedback in real-time. 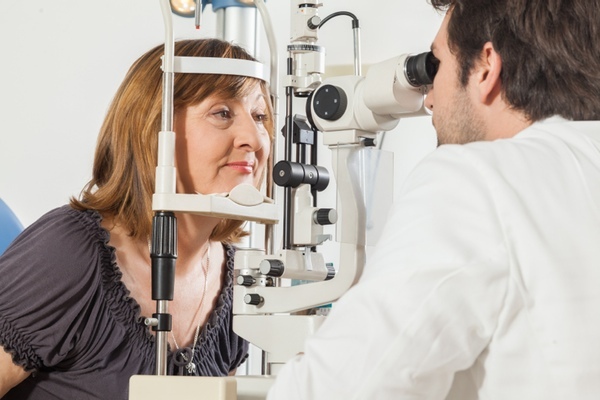 That way, if a finding of concern is seen, the ophthalmologist can direct the device operator to perform additional maneuvers to inspect further. One obvious critique is that the standard slit lamp apparatus is still required and, as a result, the same equipment costs apply. Perhaps future evolutions of this platform will include slimming down to a lower-cost peripheral optimized for a mobile device. Innovators like those at EyeNetra have demonstrated the feasibility of doing that when it comes to standard vision exams. Ye Y, Wang J, Xie Y, Zhong J, Hu Y, Chen B, He X, Zhang H. Global Teleophthalmology With iPhones for Real-Time Slitlamp EyeExamination. Eye Contact Lens. 2014 Jul 30.